Beck: "It's insanity. 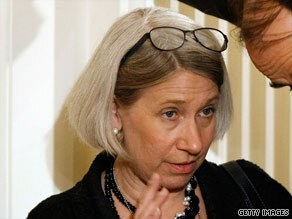 This is her hero's work"
WASHINGTON (CNN) -- White House communications director Anita Dunn fired back at criticism from TV commentator Glenn Beck on Friday, saying that a Mao Tse-tung quote Beck took issue with was picked up from legendary GOP strategist Lee Atwater. White House communications director Anita Dunn says she picked up a Mao quote from a legendary Republican. "The Mao quote is one I picked up from the late Republican strategist Lee Atwater from something I read in the late 1980s, so I hope I don't get my progressive friends mad at me," Dunn told CNN. As for Beck's criticism: "The use of the phrase 'favorite political philosophers' was intended as irony, but clearly the effort fell flat -- at least with a certain Fox commentator whose sense of irony may be missing." On Thursday night's program, Beck showed exclusive video of Dunn discussing the communist leader, who was responsible for a cultural revolution in 1966 that included re-education camps and setting the army and students on witch hunts against his opponents. Millions of Chinese suffered or died, most notably teachers, writers, political opponents or anyone deemed a "reactionary." Dunn, taped in a speech in what appears to be a church, said the leader's philosophies were a guidepost for her own strategy on politics. She also praised the philosophy used by religious icon Mother Teresa. "The third lesson and tip actually comes from two of my favorite political philosophers: Mao Tse-tung and Mother Theresa -- not often coupled with each other, but the two people I turn to most to basically deliver a simple point which is 'you're going to make choices; you're going to challenge; you're going to say why not; you're going to figure out how to do things that have never been done before." The comments set Beck into a tirade. "It's insanity. This is her hero's work," he said. "She thinks of this man's work all the time? "It would be like me saying to you, 'you know who my favorite political philosopher is? Adolf Hitler.' Have you read Mein Kampf? [She wants to] fight your fight like Hitler did," Beck said. Dunn recently blasted Fox News saying that the cable news organization often operates as either "the research arm or the communications arm of the Republican Party." "When he [Obama] goes on Fox, he understands that he's not really going on it as a news network at this point. He's going to debate the opposition. And that's fine. He never minds doing that. "They're widely viewed as a part of the Republican Party. Take [the GOP's] talking points, put them on the air, take [the GOP's] opposition research, put them on the air," Dunn said. Fox News in a statement to CNN said its programming was comparable to the editorial page of a newspaper. Still, Beck wasted no time Thursday in using Dunn's comments to blast the Obama administration for promoting what he deems a radical agenda. "America, how many radicals is it going to take? How many radicals surrounding our president before you understand that when the president said he wants to transform the country, he wants to transform it all right," Beck said. "He'll go on Fox because he engages with ideological opponents," Dunn said. "He has done that before, and he'll do it again." But it's not just Dunn, a Democrat, who has used Mao as someone she reads. Media Matters for America, a liberal media watchdog group, points out that former Speaker of the House Newt Gingrich, also a Fox News contributor, quoted Mao in a 1995 Roll Call profile. "War is politics with blood; politics is war without blood," Gingrich said, citing Mao. Karl Rove, another Fox News contributor, wrote in a December 2008 Wall Street Journal op-ed that President Bush "encouraged me to read a Mao biography." Beck led the charge against Obama's former green jobs czar Van Jones over a petition Jones signed in 2004 calling for an investigation into whether government officials deliberately allowed the September 11, 2001, terrorist attacks to occur. Jones said of the petition on the Web site 911truth.org: "I do not agree with this statement and it certainly does not reflect my views now or ever." Jones has also come under fire for comments he made, also before his White House job, including those in a video on YouTube. In it, he uses a vulgar expression to describe Republicans. Jones resigned from his post in September, saying in a statement that he came to Washington to "fight for others, not for myself." "I cannot in good conscience ask my colleagues to expend precious time and energy defending or explaining my past. We need all hands on deck, fighting for the future," Jones' statement said. Jones is a co-founder of colorofchange.org, a group that recently has been pressing advertisers to boycott Beck's program after Beck called Obama a racist.